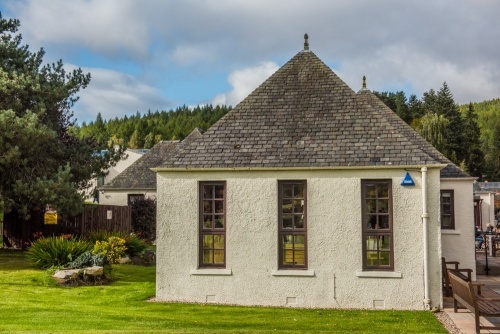 This small museum, which forms part of the popular House of Bruar complex, tells the story of Clan Donnachaidh, thought to be one of the oldest clans in Scotland. The clan traces its history back to the old Celtic Earls of Atholl. Perhaps the most famous name in the early lineage of clan descent was Abbot Crinan of Dunkeld, the father of King Duncan, who was murdered by Macbeth. Duncan's younger son, Maelmare became Earl of Atholl and was the ancestor of the chiefs of Clan Donnachaidh. The first recorded clan chief was the early 14th-century warrior, Duncan the Stout. In this case, stout does not refer to his physical build but to his valour in battle. Perhaps the most famous chief was Alexander Robertson of Struan, known as The Poet Chief, who fought in all three Jacobite rebellions, in 1689, 1715, and 1745. Struan was briefly captured by a British trooper at the Battle of Sheriffmuir in 1715. He was in the act of giving the trooper his purse when rescue arrived. The trooper turned to run away, but called out as he ran, 'Your purse by right is mine.' Struan replied, 'Yes it is. Pray come back for it'. The trooper, not surprisingly declined the invitation and made his escape. But Struan had been serious; he found out the man's name and sent him the purse, containing 60 guineas. When the 1745 rebellion broke out Robertson was too old to take up arms himself, so the Robertson men were actually led in battle by his cousin Donald Robertson of Woodsheal, though Alexander Robertson attended the Battle of Prestonpans as a spectator rather than an active participant. The government army at Prestonpans was led by Sir John Cope. After the Scots emerged victorious, the old Poet Chief rode home in Cope's coach, wearing his gold chain and wolfskin cloak and drinking his brandy. The road ended at Tummel Bridge so the victorious clansmen took the wheels off the coach and carried their chief on the final leg of his journey to his home at Mount Alexander. Donald Robertson of Woodsheal was wounded at the Battle of Culloden in 1746 and left for dead on the battlefield. A pair of old women helped him to hide and he was able to escape to exile in France. He was allowed to return to Scotland in 1772 and died 3 years later. 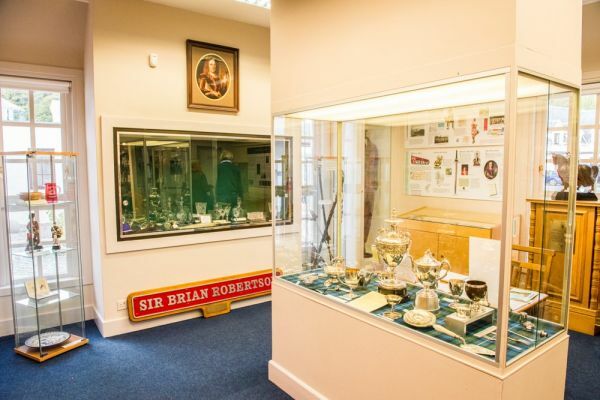 The museum in Bruar opened in 1969 with four broad aims; to showcase clan history, the countryside traditionally home to clan members, the lives of individual clansmen and women, and the work of the clan society. 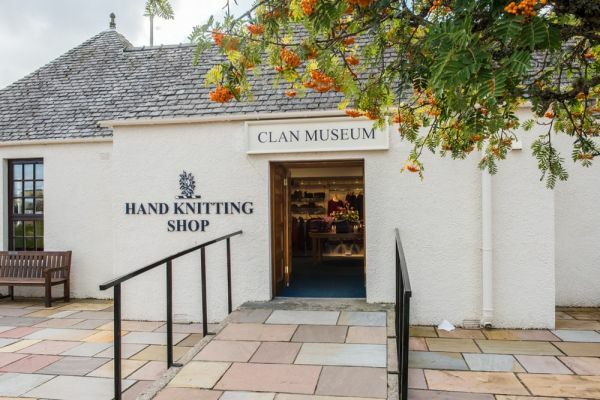 The museum shares space with a gift shop featuring traditional knitwear, and beside the shop/museum is a reading room holding archives of clan materials. Immediately outside the museum is a striking memorial to the 51st Highland Division, depicting a Highland piper. Clan Donnachaidh had strong links to the Jacobite cause so it is not surprising to see several mementoes of this period including a pair of jewelled shoe buckles said to have been worn by Bonnie Prince Charlie at a ball in Perth. Beside the shoe buckles is a gold ring with a lock of hair set under a crystal. 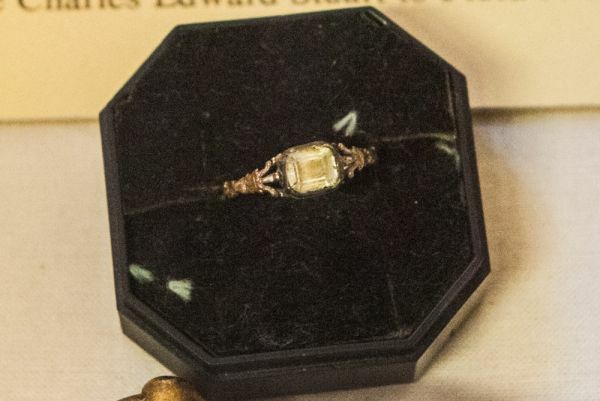 The ring is traditional said to have been given to Flora MacDonald by Bonnie Prince Charlie in gratitude for her help in escaping government troops following his defeat at the Battle of Culloden. 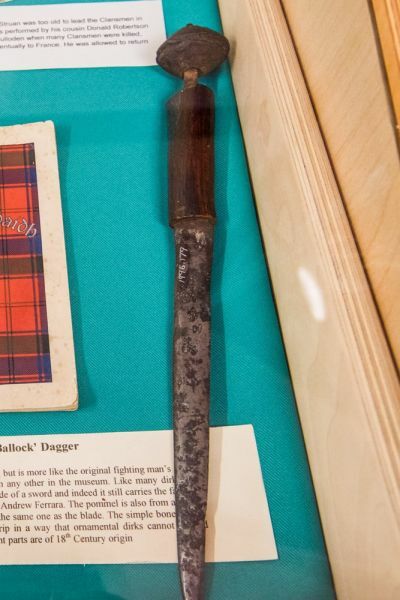 One display looks at famous Jacobite warriors of Clan Donnachaidh, including Duncan Robertson of Auchleeks, who is thought to have been the last Jacobite to stop fighting at the Battle of Culloden, even though he was wounded. Robertson refused to obey the laws against Highland customs that were introduced after the Battle. He continued to wear his tartan and carry a dirk, and drank to the 'King over the Water'. This caused family friction after his son eventually joined the British army. Father and son reached a compromise and drank toasts simply to 'The King', covering both ends of the political spectrum at once. One unusual item is a 'Ballock' Dagger, an 18th-century dirk formed from the broken blade of a sword. You can still see an inscription on the blade from the famous sword-maker Andrew Ferrara. The pommel also formed part of a sword, though probably not the same one as the blade. Next to the dirk is a powder horn dating to around 1720. In another display case is the crest of Adam, 1st Viscount Duncan (1731-1804). Viscount Duncan served as Admiral of the British fleet and earned fame for his role in winning the Battle of Camperdown against the Dutch in 1797. 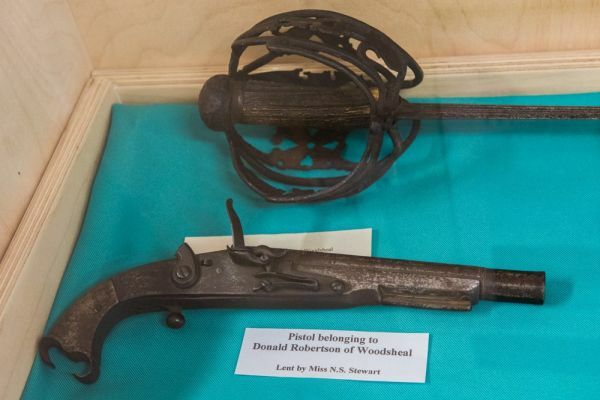 In a neighbouring display case is a Dutch swivel gun from the vessel 'Vrijheid', seized as a prize of war during the battle. 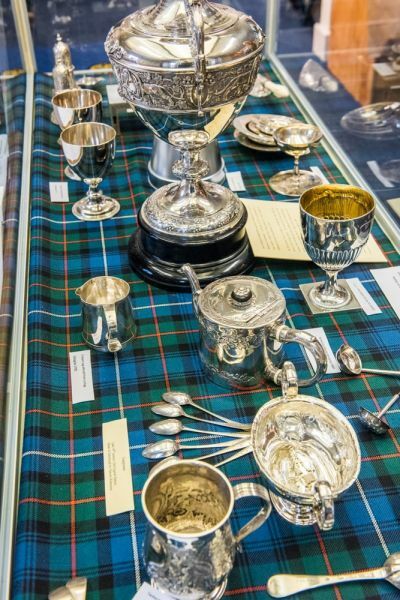 The museum is full of fascinating brooches, pins, medals, and small silver items including a delightful plaid brooch given by the Countess of Airlie in 1873 to Alexander Robertson of Glenisla for being the 'Best attired Highlander' for three straight years during the annual Glenisla Games. Then there is a worn axe used by Alexander 'Dundonnachie' Robertson of Dunkeld. Dundonnachie used the axe as a leader of the Dunkeld Pontage Riots of 1869, a protest against tolls levied by the Duke of Atholl for crossing Dunkeld bridge. The Duke initially levied tolls to pay for bridge construction in 1803, but the tolls were still being charged decades later, leading local residents to rise up in protest and throw the toll gates into the River Tay. 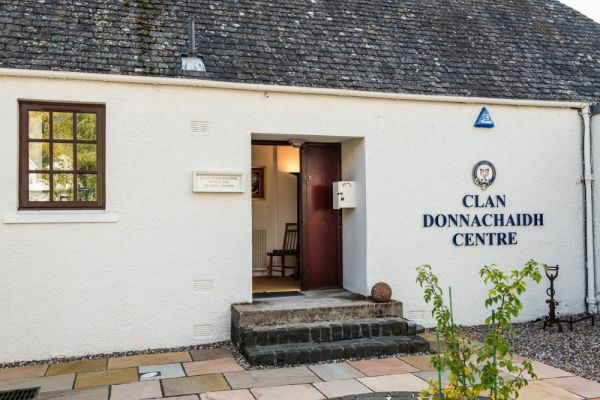 The Clan Donnachaidh Museum is small, but it packs a lot of interest into a small space. I loved the fascinating histories of clan members of the 18th and 19th centuries and the historical notes provided for individual items on display. The museum is extremely easy to find. 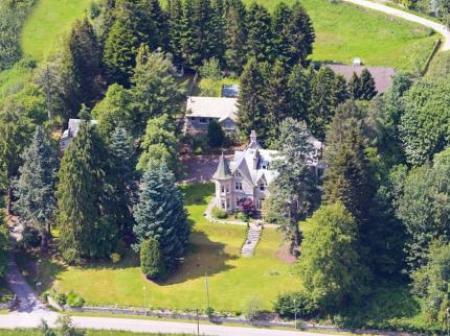 Just follow the very obvious signs for the House of Bruar off the A9, west of Blair Atholl. The museum is the very first building you come to on your left as you enter the House of Bruar complex. There is ample free parking, and the museum is normally open regular business hours.